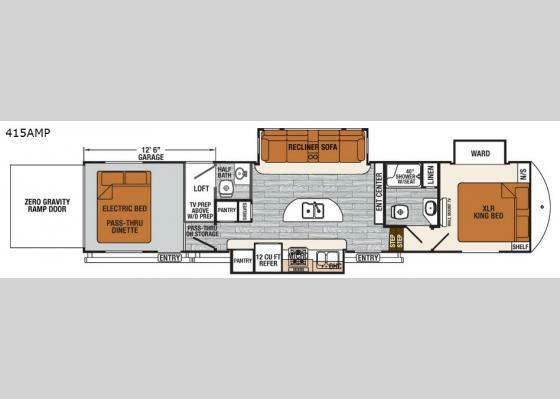 Forest River offers the XLR Thunderbolt 415AMP toy hauler fifth wheel with triple slide outs, dual entry doors, a kitchen island, a king size bed, a loft, and 12'6" of cargo space, plus so much more! As you enter via the zero gravity ramp door at the back of this toy hauler fifth wheel, you enter 12'6" of cargo space. The garage includes an electric bed with a pass through dinette beneath, TV prep and washer/dryer prep, a side man door, plus a loft with pass thru overhead storage over a portion of the cargo area. There is also access to a half bath with a toilet, vanity sink and medicine cabinet. Moving into the living area from the cargo space, there is a pantry and shelves for storage to your left. A slide out along the entry side includes a pantry, refrigerator, counter space, overhead cabinets, and a three burner range with a microwave above. A kitchen island in the center of the room includes a double sink for easy clean up. Across the toy hauler, a second slide out provides a recliner sofa. An entertainment center is along the front wall for easy viewing from any seat. Up the steps towards the front, you will find a side aisle bathroom with a linen cabinet, toilet, shower with seat and vanity sink. The front private bedroom includes a XLR king bed, nightstand, shelf, wall mount TV, and a slide out wardrobe for additional storage for your camping clothes.